Although water is a contentious resource in terms of human use and consumption, particularly in the southwestern United States (U.S.), its presence is not always considered valuable or welcome. 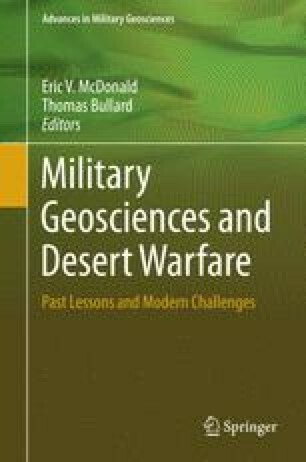 Where water accumulates on the flat, hard surfaces of desert playas used for the military mission, ephemeral conflict with nature occurs; conflict present only so long as standing water persists into scheduled use for training and testing. Flood occurrences on playas where runways and flightlines are established may incur added financial burden due to unanticipated scheduling changes in training and testing, or damage to infrastructure. The ability to better estimate and predict flooding events including duration and frequency of inundation, which could affect use of playas with infrastructure, may present range managers with a means to avert potential conflicts. For this reason examining the current model that incorporates watershed parameters and Doppler-radar precipitation measurements to estimate runoff onto Rogers (Dry) Lake at Edwards Air Force Base (EAFB), U.S.A. was done. Satellite imagery and digital elevation model data are spatially explicit (associated with a geographic location) and present that advantage both for planning and to provide comparison of model estimates. The degree to which either or both approaches reflect ground condition following storm events was quantified. Pre- and post-standing water extent for the two significant rainfall-runoff events was mapped from Landsat satellite imagery and standing water volume on the playa was then calculated using a high spatial resolution LiDAR–derived digital elevation model (DEM). These results were compared to the runoff volume estimates made from a model that extrapolated precipitation from Doppler-radar and meteorological stations within the Rogers Lake watershed. The results showed both over- and under-estimated playa inundations when compared.